Ho Ho Ho!! We need to get your company logo out there this christmas and gain some attention from customers and clients!! Perfect on a budget You needn't worry about breaking the budget this year. Customers will absolutely adore these Promotional Chocolate Calendars and as a good-will gesture why not hand these out to potential customers and clients to make sure you spread around some reciprocation and good-will about? This is the ideal calendal focusing on the December month - with 24 dates available to offer a daily treat. 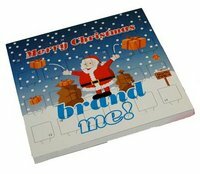 Customise and personalise your company logo for this December Christmas Chocolate Calender. 24 Dates - each one filled with a luxurious milk chocolate block (Redbows™ promotional chocolate). Print the Company brand name and Logo of your company in 1-4 CMYK imprint. Make a difference this christmas.